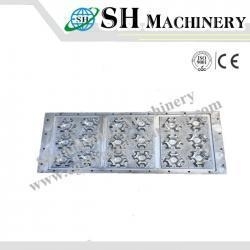 We also can design the egg carton mold according to the customers’ requirement. According to the customers’ requirements and circumstance, we make the best egg tray production line design. Located in the great man Mao Zedong's hometown, the birthplace of China Pulp Molding technology, Xiangtan Shuanghuan Machinery Development Co., Ltd.(SH Machinery) possess a superior geographical condition and convenient transportation of Shanghai-Kunming, Wuhan-Guangzhou high speed rail and Beijing-Zhuhai expressway. It is one of high-tech enterprises in Xiangtan German Industrial Park,the national high tech demonstration zone. Uphold its near 30 years'technology accumulation, SH Machinery is a national high-tech enterprise. With its outstanding research and production capability of pulp molding machines and molds, SH Machinery possesses the most advanced pulp molding technology in China. It has a wide variety of products such as reciprocating forming machine, rotating forming machine, double rolling forming machine,tiltering forming machine, integrated machine, plastic and aluminum pulp molds for and eggs, fruits and industrial products etc.. In 1992, our rotating forming machine filled domestic blank and won the second prize for progress in technology from National Packaging Company; in 2007, our cross-rolling egg tray machine was created as the first one in china with world advanced technology; Our Wire mesh mold won the national utility model patent; In 2012, our integrated forming machine has gained Chinese patent of utility model. SH Machinery has gained CE safety certificate, ISO9001 quality certificate. Aimed at energy saving and environment protection, our products are favored for their advanced design and reasonable process by clients from domestic market, and exported to Africa, southeast Asia, Russia, South America and other countries and areas. Adhering to a concept "pursuit of excellence, sincere to integrity " , SH Machinery always pursue an objective of: customer first, prestige,humanity, teamwork, career enthusiasm and active learning. Commitment: to meet all reasonable requirements from clients, provide most complet service including project design, products design, installation and debugging, to ensure no worry for clients. 1. Pulp molding product lines such as egg tray/egg carton production line, fruit tray production line, pulp molding industrial package production line. 2. Molds for pulp molded products.